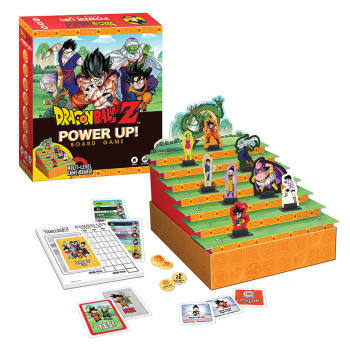 Join the Z fighters as you compete to defeat the dragon and become the next champion in Dragon Ball Z Power Up! Board Game. Each player starts with a unique line-up of characters that they are trying to score the most points with. Players take turns moving any character up the board until a character gets to the top. Once a character is advanced to the top board, players vote to see whether the character stays or is kicked off the board. It takes only one NO vote to get them off the board - but players should use their NO votes wisely as each player has only two NO votes in their hand. The round ends when the character is unanimously voted to stay at the top.